So I have been very busy lately. If you follow me on FB or IG you will know the following. We moved both our stores together to one new location! We started Dec. 26 and opened Jan. 6, one week ahead of our self imposed opening day. We are very tired but it is a good tired! As you may remember my Longarm was in our classroom. Now I have my own space!!!!!! I am thrilled with my new space! 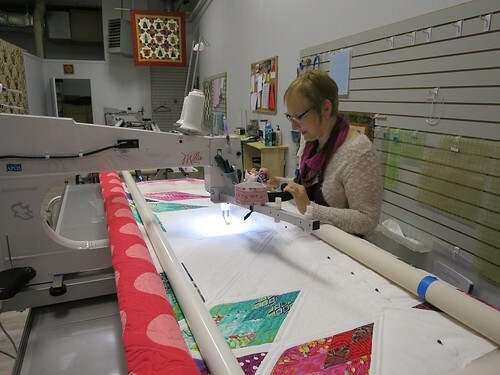 Not only that we added Quilt Path to my 2009 Millennium and added a new Milli!!! I have a new assistant, Sabrina, who introduced herself here earlier today with the handle Fried Green Tomatoes. Sabrina will be helping me with all sorts of things as well as running Quilt Path. She is young, and catches on to computer stuff very fast. 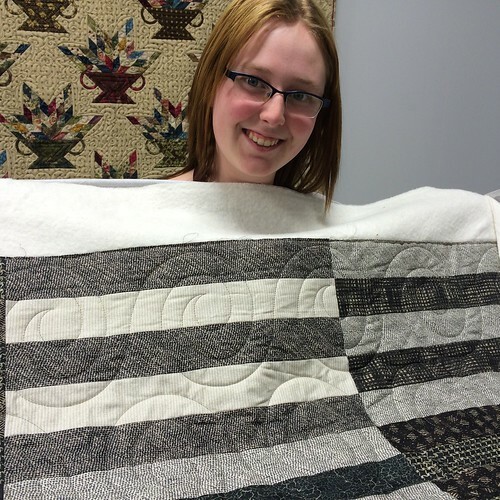 6B9B01ED-FE6B-4EDB-A098-DA18F61F07D7-172 by -RoseCity Quilter- Sabrina and her 1st Quilt Path quilt! My new pressing station, 111" long! Hope to see your new shop in the not so distant future! I have to admit I'm very jealous of your 'super sized' ironing table! Welcome Sabrina, I like your forum name! Would so love to show it to you Kathy!!! And the super sized ironing table is so amazing! Congratulations on the new store. I hope that I can get up that way one day to check it out, and absorb your wealth of knowledge while I am there. Best of luck until then, and keep sharing your eye candy. It looks like a great space. I am with Kathy, I love your ironing board! Congrats on your new location! How exciting! BTW I am jealous of your Ironing Station (board)! I'm jealous. What a great space! I like the way you can extend the ironing station or not. Ardelle, it is wonderful. Thanks for sharing. I know you love it, QP and your new Millie! Very nice. 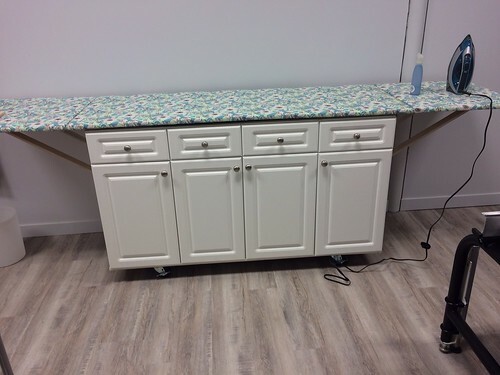 LOVE your ironing station!! Congrats, studio looks great. My ironing board is only 82 inches long, I made it out of a door we removed from the house.. Now I just need to get a longer frame for "Gator:. Thank you for the note. I made this table a few months ago. Found the table at a thrift store, spray painted it black, topped it with plywood, quilt batting then fabric. Found some instruction on Youtube. Do it!